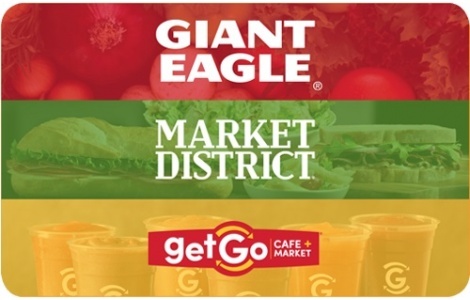 Giant Eagle Gift Cards — Something for Everyone! When you give or get a Giant Eagle gift card, you simply can’t go wrong. It pays for everything from freshly prepared foods, fresh produce and fresh-cut meats to groceries, prescriptions, laundry detergent, pet food — or redeem it at GetGo for fuel and food. You can even use your Giant Eagle gift cards to buy other retailer gift cards and earn fuelperks on all of your purchases! Everything everyone needs to eat well and live better: that’s the beauty of the Giant Eagle gift card. Your use of this card constitutes your agreement to these terms: This card may be used for any purchases at participating Giant Eagle®, GetGo®, Giant Eagle Market District®, Giant Eagle Express®stores, and WetGo® Car Wash locations, except for the purchase of items prohibited by law. This card is nonrefundable, will not be exchanged for cash, and will not be replaced if lost or stolen.